Ironing shirts was never Aisling’s idea of fun but one day while ironing a shirt she got whilst travelling in Bangkok she noticed that although it had been through MANY washes, it still looked like brand new. That was her light bulb moment. She was considering going back to work but wanted something that she could do that would fit in with her family. She emailed the tailor in Thailand where she got the shirt and after discussing it with her husband Stephen they decided to start a business! 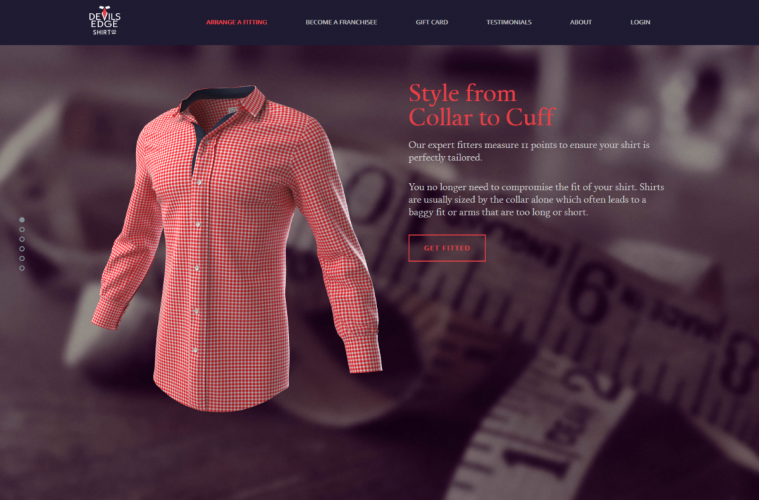 Founded by Wicklow based husband and wife team Stephen and Aisling Power, Devils Edge has over 1300 clients in Ireland and the U.K., who enjoy perfectly fitting shirts, without having to break the bank. Customers come from all walks of life and include professionals, bankers, small business owners, motor mechanics, leading Irish sportsmen and Politicians. Girlfriends and wives are also big clients! Featured on Dragons Den 1 May, The couple secured a 70K investment from Eamonn Quinn. Devils Edge allows men to get the perfect fit at a similar price to a mid range shirt available in the High Street. With over 1200 fabrics to choose from and a choice of 8 collar styles and 10 different cuff styles the client can design and create beautiful, bespoke and made to measure shirts from €75.